One night in the summer of 2009, Jeremy Spittle emerged from a hot tub covered in hives that itched “four times more than poison ivy.” For months, his skin broke out like this every few days. The only thing that helped was doubling – sometimes quadrupling – the recommended dose of Benadryl. One time, the reaction was so bad it required a trip to the emergency room. Another time, Spittle fainted in the bathroom, hitting his head on the sink as he fell. He tried cutting alcohol from his diet. Then milk. Then vegetables. It was during this “trial and error period” that Spittle’s father stumbled across a Washington Post article detailing cases of a new meat allergy with symptoms ranging from hives to anaphylactic shock. The cause? Spittle, 33, who lived in Nokesville, Virginia and worked frequently outdoors for Northern Virginia Electric Cooperative, had been bitten by multiple ticks earlier that spring. The stories and symptoms in the article seemed to echo his experience. Was this tick at the root of his problems, he wondered? 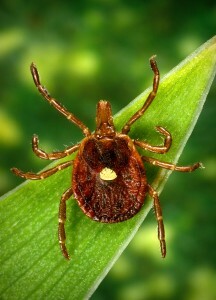 The Lone Star tick is a medium-sized, reddish-brown tick that’s common in the Southeastern United States. It gets its name from a white dot found on the backs of all female adults. Nymphs are the size of a lower-case “o” in newspaper print, expanding to the size of a zero when fully engorged, said Phillip Kaufman, associate professor and entomologist at the University of Florida. Adults are the size of a capital “C,” but engorged, can swell as large as a raisin. Lone Star ticks bite humans by inserting needle-like mouth parts into the skin, while backward-facing teeth act as hooks, securing them in place. They also secrete a cement-like substance that helps them to stay attached, Kaufman said. 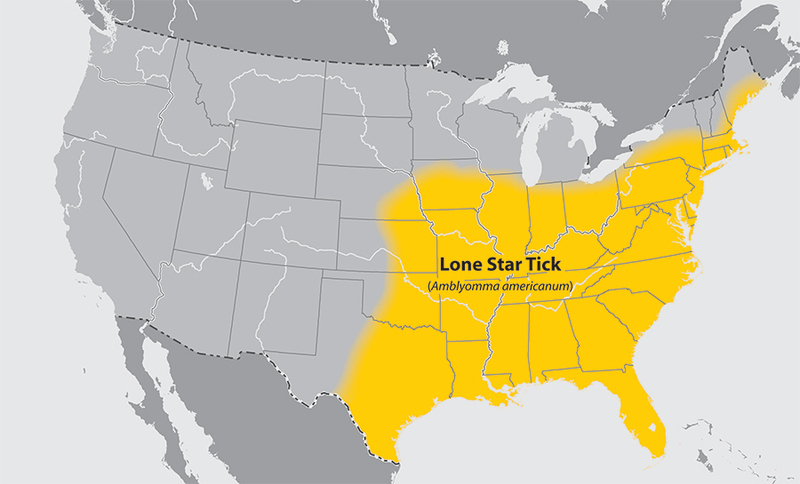 Approximate distribution of the Lone Star tick. Map courtesy of the Center for Disease Control and Prevention. Commins responded the next day, and in early November, Spittle drove to Charlottesville, Virginia where his blood was tested for reactions to cat, dog, pork and beef extract. Results showed high antibody levels for Alpha-Gal. He was allergic to red meat. According to Commins, more than 2,000 known cases have cropped up in less than 10 years in the U.S. Cases have also been reported in Australia, Germany, Japan and on the Panama Canal’s tiny Barro Colorado Island, which contains a rainforest preserve teeming with species. Hives are the most common symptom, but others include swelling and symptoms linked to anaphylactic shock, such as vomiting, diarrhea, trouble breathing and a drop in blood pressure, according to a report by the Vanderbilt University Medical Center: “Persons with the allergy can go into a delayed anaphylactic shock four-six hours after eating red meat,” the report reads. Vanderbilt University’s Dr. Robert Valet, who works at the hospital’s allergy clinic four days a week, sees one to two new cases a day, he said. The allergy has the potential to be deadly, he said, though no one to his knowledge has died of it. 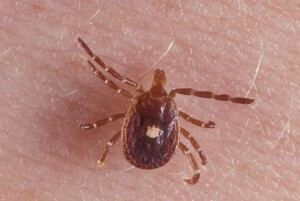 Researchers have demonstrated the allergy’s association with tick bites and a delay between the bite and reaction. (For Spittle, that delay was as long as a month.) They also know that it does not increase risk for asthma. Still unclear, Commins said, is what’s caused the recent surge in allergies and whether Alpha Gal is indeed at the root of the problem. 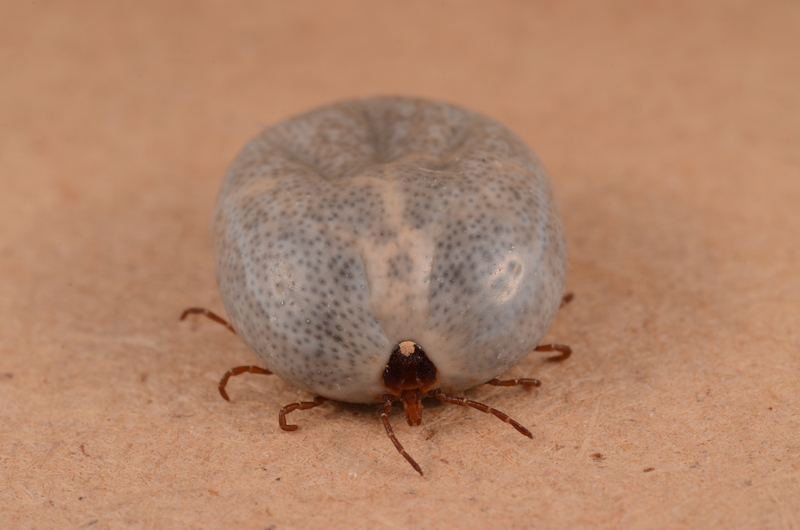 A blood-fed, engorged female lone star tick, or Amblyomma americanum. Image by Lyle Buss. “While the scientific community has demonstrated that there’s Alpha-Gal in the gut of the Ixodes ticks in Sweden, we don’t have that evidence in Lone Stars,” Commins said. Valet says that a lack of exposure to good bacteria may leave immune systems more vulnerable to this kind of infection. This is known as the hygiene hypothesis. Recent cases have not given researchers enough time to study the allergy, Commins said. Other culprits could include a new tick-based bacteria or organism, or the way humans process and handle meat. Spittle said he was not surprised by his diagnosis. “I was working indoors and outdoors at the time,” he said. “I always had ticks on me and they were biting all the time,” he said. Though there is no indication how long Spittle’s allergy will last, it’s possible that it may improve over time, Valet said. When it comes to allergies, the human immune system has a “memory,” Valet said. Proteins found in peanuts and eggs trigger the immune system faster than the proteins found in Alpha Gal sugar, which takes longer for the immune system to recognize. This explains the red meat allergy’s delayed reaction, he said. Doctors hope the allergy will be less durable than others since it’s caused by a sugar, he added. Commins, who enjoys hiking and fishing himself, advises fellow outdoorsmen to wear bug spray and layers and to check for ticks after being outside. Since his diagnosis, Spittle has been red-meat free. Before his diagnosis, he was eating it nearly every day. Correction: Due to an editing error, an earlier version of this post incorrectly identified the formal name of the sugar, Alpha Gal. It is galactose-alpha-1,3-galactose.